Today's forecast contains an additional regional swing differential for London, which polling suggests is moving in a much different direction to that of the rest of the country. Today's #GE2017 Forecast is the last to use a 5-day rolling uniform swing, with future daily forecasts using a 3-day rolling average as the campaign and polling picks up speed moving towards the final day. There will also be a PME Politics Forecast on 'election-day-eve' which will use polls from June 7th only. 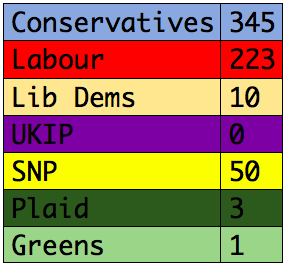 A simple uniform swing model using polls published in the last 5 days produces the following result: Conservatives (332), Labour (328), Lib Dems (4), UKIP (0), SNIP (54), Plaid (3), and Greens (1). The averaging function of the most recent polls implies a Conservative swing of around +8.5, and a Labour swing of about +5%. This moves the result much closer together than that which the 6-point gap between the two parties produced in 2015. An increase of just one seat and a majority of 14 for Theresa May would undoubtedly be seen as a very bad night. 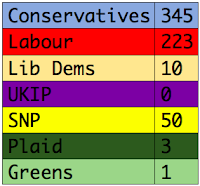 The 'polls plus' model adds more seats to the Conservative's tally, but today predicts the smallest Conservative majority to date of just 40 seats. Even a majority of 40 (compared to 14) would not be considered a good night for the Tories, given a) their position in the polls at the start of the campaign, and b) that this snap election was 'called' with the precise aim of giving the Prime Minister a large and commanding majority as she headed into the Brexit negotiations. 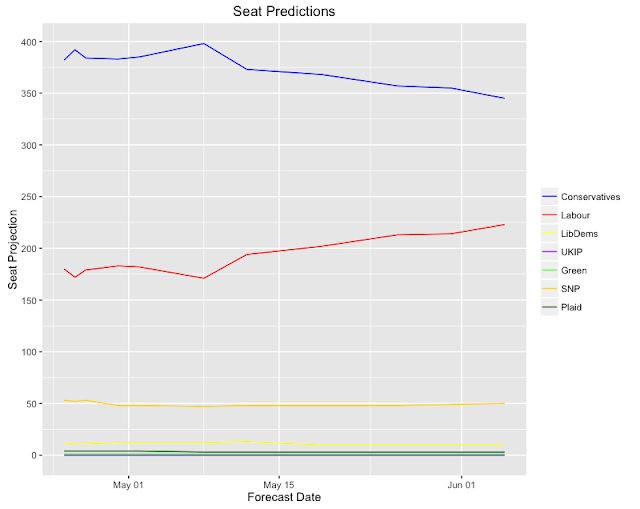 The projection tracking graph shows the predicted gap between Britain's largest political parties continuing to narrow, and also highlights the model's early pick-up of this trend (in the first week of May). 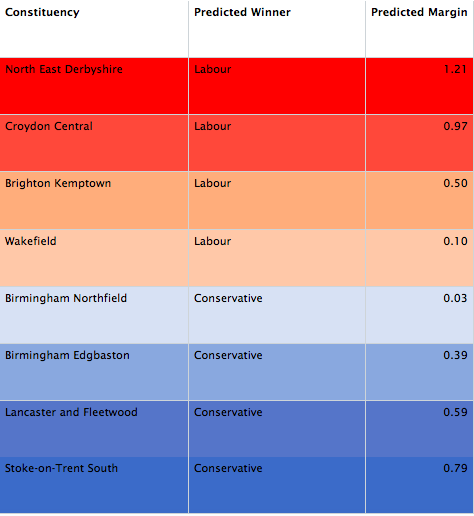 Finally, the predicted marginals continue to move back towards the 2015 result, with the model projecting that the fault line between Labour and the Conservatives when the dust settles on June 9th will be between Wakefield and Birmingham Northfield. Croydon Central, a tight Tory-Lab marginal, is predicted to move into the Labour column - Labour are doing well in London according to recent polling. The 'progressive alliance' is also expected to tip Brighton Kemptown into Labour hands, with the Greens standing down and backing the Labour candidate. Although the reality with these forecasts is that the result in the seats below is currently too close to call. #GE2017 Night - Oh What a Night! #GE2017 - What Will Happen to Student Seats?